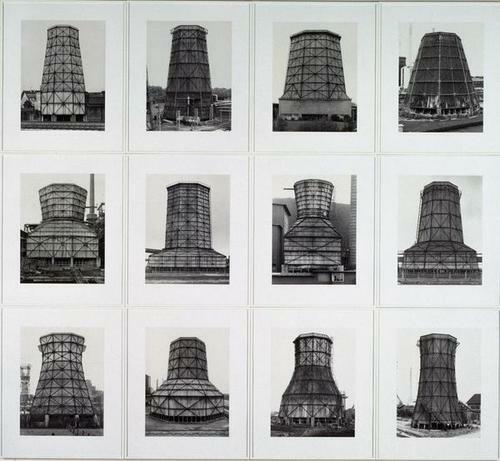 Bernd and Hilla Becher were forerunners of the new objective German photography, who used, for their own account, the legacy of August Sander. On 9 March 1969, they exhibited at the Kunsthalle in Düsseldorf with a series of photographs of Hauts-fourneaux, Gazomètres, Châteaux d’eau, Tours de refroidissements and Pompes à pétrole uner the title Sculptures anonymes. This series represents the essential data of a very objective photographic inventory (typologies)--a visual memory of obsolete industries. Each typology encompasses twelve carefully organized photographs, arrayed in horizontal and vertical lines, typifying the industrial aesthetics of a period. Certain photographs show colour alterations. 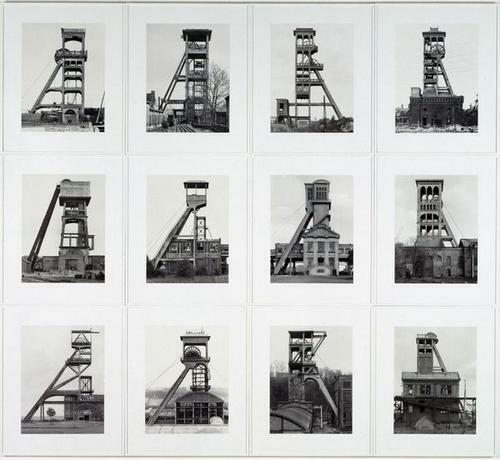 In her Düsseldorf studio, thanks to the patronage of Sotheby’s, Hilla Becher carried out a re-print of the photos making it possible to retain the aesthetic coherence of each typology.